Mother's Day is coming up next week, and if you're checking this blog out on Sunday May 3 (and who isn't) here's a great gift idea for Mom. 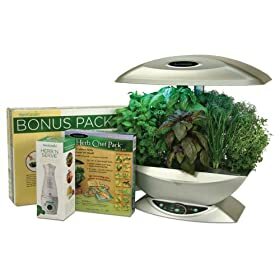 Amazon has a Gold Box Deal today only with the best price I've seen yet on an Aerogarden. For $99.99, you get the silver AeroGarden Classic with 7 herb pods AND a free "Herb and Serve" dressing and marinade maker. I admit I am jealous because I paid $50 more and didn't get the Herb and Serve. Just click here and enjoy! Today's Gold Box .